Ever since I moved to our new office at Mahim, I have been trying out restaurants in the area. 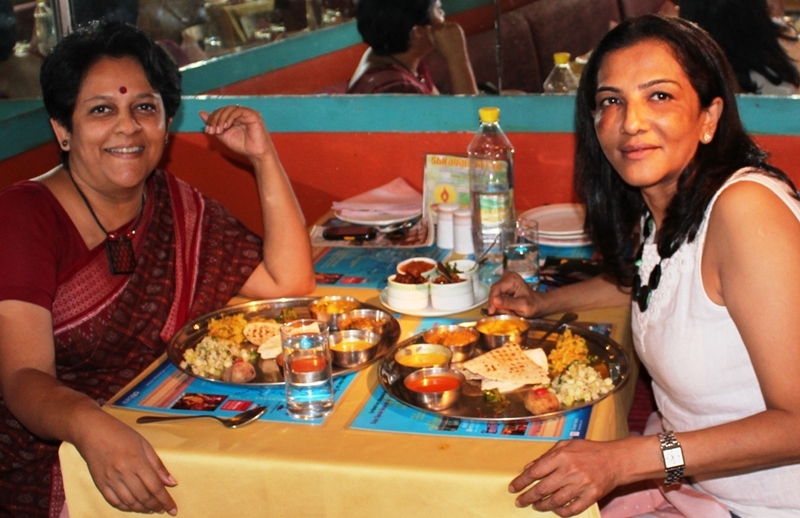 Last week I dragged my friend Kiran to Diva Maharashtracha, to check out their thali. The first thing we got was the accompaniments to the thali: and what a fabulous set of 4 they were! The red powdered mix is lasun chatni, made with garlic and dried coconut. Just a little bit of it is enough to bring all your tastebuds tinglingly alive! 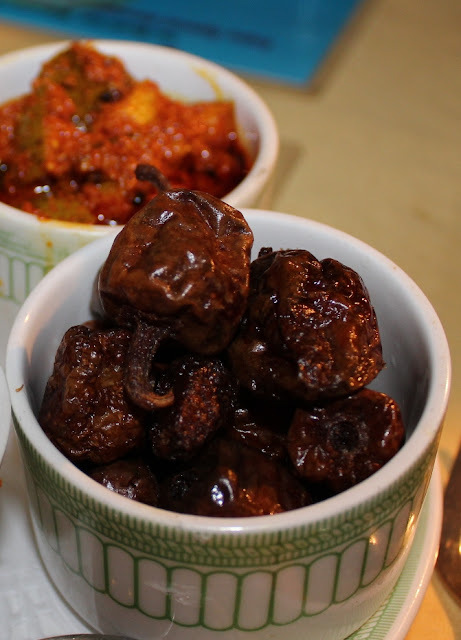 It is among the most widely used accompaniments in Maharashtrian food. You'll find many vada-pav sellers in Mumbai using lasun chatni to add a kick to their vada pav. In rural Maharashtra, you'll find farmers using this to spice up a simple bhakri / roti. 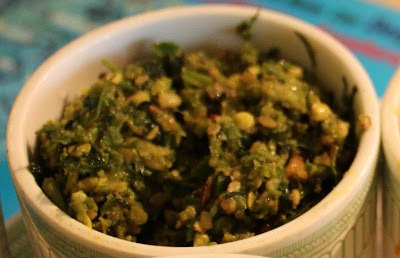 Lasun chatni is really simple to make - slice dried copra into manageable bits, saute it with a few cloves of garlic in a table-spoon of oil, add chilli powder and salt - and grind it all together without adding water. That's it. You're good to go. The copra gives it a sort of nutty flavour. You can adjust the garlic and the chilli powder to whatever suits you. Like I said, this is a miracle powder and gives everything an amazing zing - add it to hot fried potatoes, or sprinkle it over onion bhaji and see how it perks up everything. Oh and one more thing - remember, anything you make with coconut or dried copra should be either consumed quickly or refrigerated. Take a table spoon or two of oil, heat and add turmeric and hing (asafoetida) to it. Roast a few green chillies in it (lightly please... just for a min or so to soften them). Now take it off the flame, add a few cloves of raw garlic and salt and grind it coarsely. You could add a few drops of lemon juice to add the tang. Sounds delightful, really. And even writing about it is making my mouth water!! 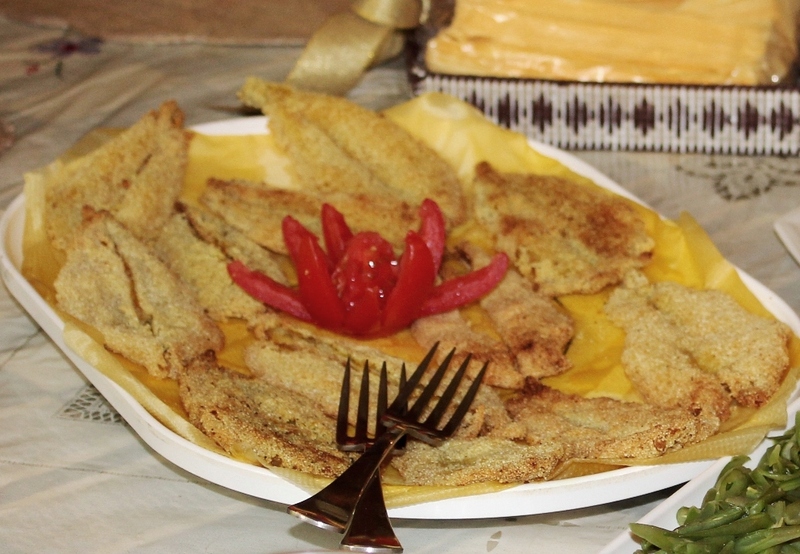 All Maharashtrians know (and have eaten) sandgi mirchi at some point in their life! 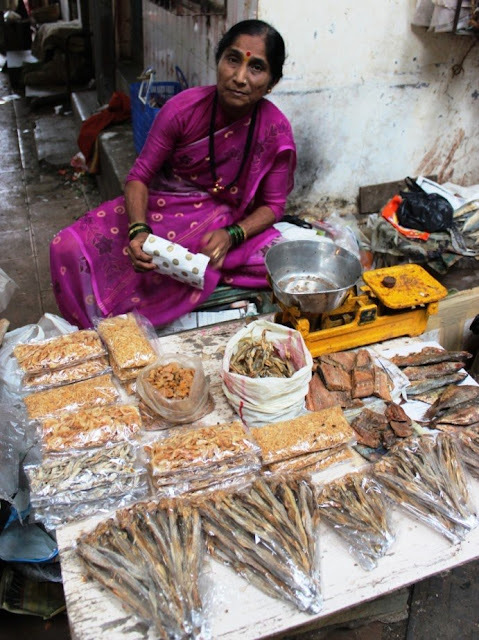 It is made, not only in Maharashtra, but all over Southern India, with slight variations. You find some not-so-spicy green chillies, soak 'em in buttermilk and spices, then dry them, and deep-fry them. According to my friend Sujata Patil, in Maharashtra, the chillies are soaked in buttermilk with a mix of fenugreek seed powder, coriander seed powder and salt. I've also seen variants with asafoetida in it, cumin in it (but in general everyone agrees there should be fenugreek!). When the green chilli has absorbed the buttermilk, you sun-dry it; then put it back into the buttermilk for soaking, then dry again, then back again, etc, for about 4-5 rounds, until you've got chillies that have completely absorbed all the buttermilk. Then you dry everything one final time, and bottle it away for deep frying later. The mango pickle that you can see behind the sandgi mirchi is also tasty; and apparently the magic ingredient is a thing called Kepra Pickle Masala, which is made by a Pune-based company. I have to look for it next time I go there! 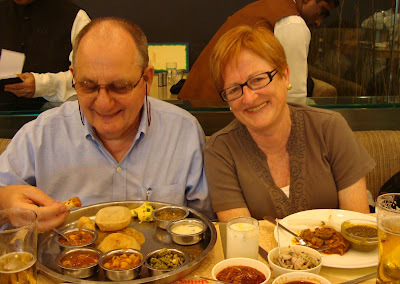 But our thali had a whole bunch of other things - and it would take me a lifetime to describe everything! This isn't even a complete photo of the meal :) After this, there was Masale Bhaat and two types of dessert as well. 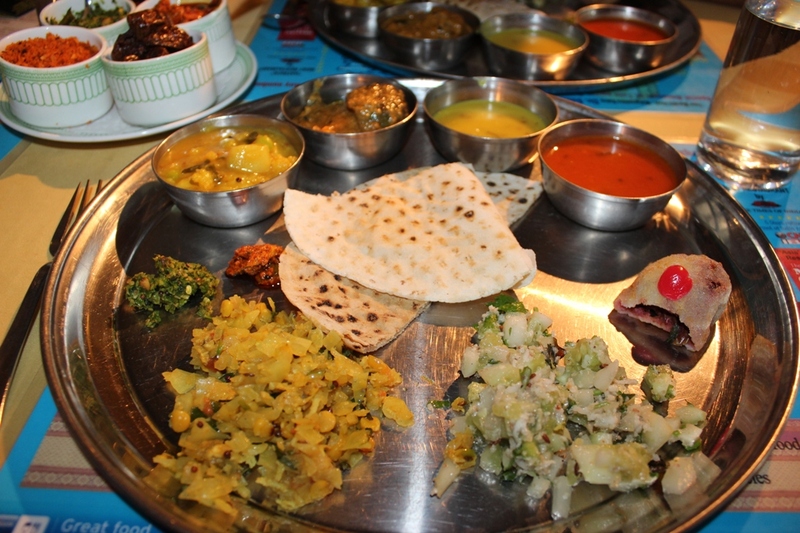 I really enjoyed this thali, because it was so different from the usual Gujju fare I eat all over the city. 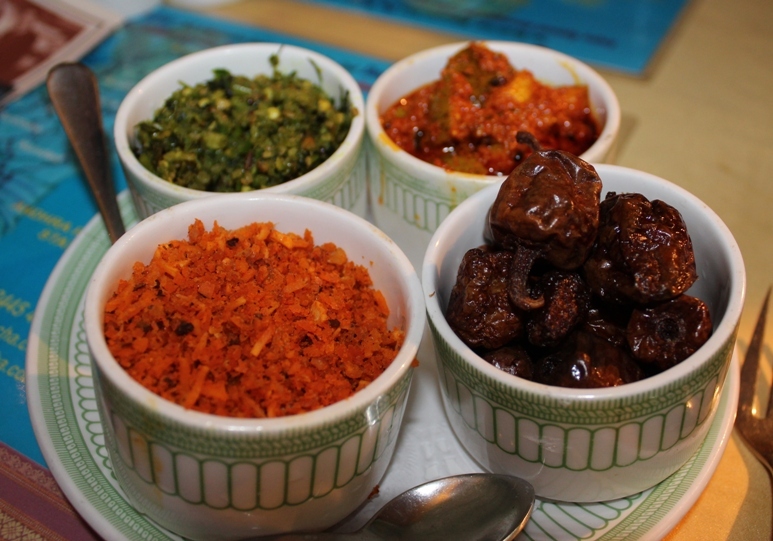 Maharashtrian food is really Mumbai's secret cuisine, waiting to be discovered and celebrated. If you drive past Byculla, you'll spot this handsome building on the main road. I've always wondered what this building is about, especially given the prominent logo in the middle. The logo looked vaguely Christian to me, but could well have been something Jewish or Zoroastrian. Today I did some searching around, and found out: this is Seva Niketan, a Christian Life Community (CLC) centre in Mumbai. The CLC is what is called a Sodality; a group of lay Christian people who get together for their own spiritual upliftment and to do pious acts and charity. The CLC congregations have traditionally been led by Jesuit priests. In case you didn't know who the Jesuits are, they are a group of trained priests, who on behalf of the Roman Catholic Church, do missionary work. Ignatius of Loyola was the founder of the Jesuit order (the correct name is the Society of Jesus). Loyola is a small village in Spain. It was Ignatius who sent Francis Xavier to India in 1542, to begin the (very successful) Jesuit presence in India. 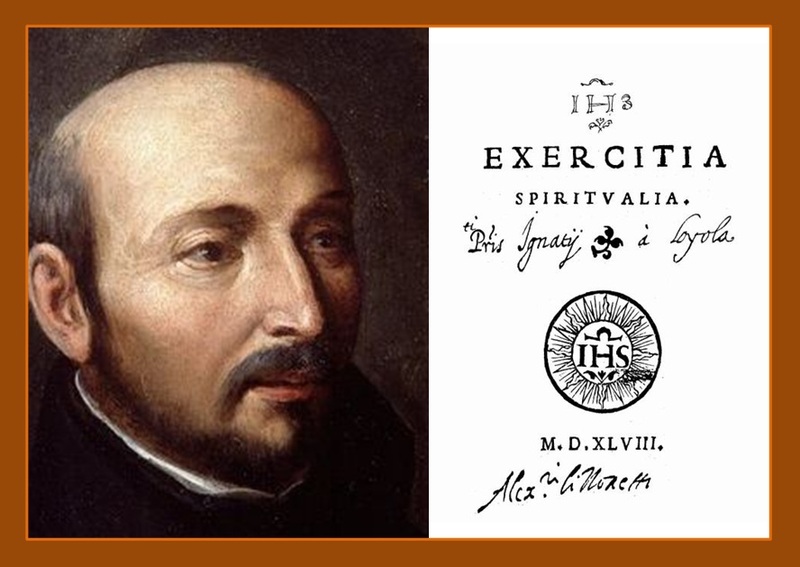 Ignatius wrote a set of exercises, called Exercitia Spiritualia, which is even today used to train novitiates. The Spiritual Exercises of Ignatius involve a sequence of specific silent prayer and meditation, divided into 4 weeks or phases. These can be used, not just for those training for priesthood, but also by more devout Christians for a more spiritual life. At Seva Niketan, based on the teachings of Ignatius, the Christian Life Community organises spiritual get-togethers, prayers and community programmes. Several non-profits are also based here, in keeping with the Jesuits belief of "prayer in action". See the X and the P in the middle? That combination stands for Jesus. XP includes the Greek letters CH (Chi) and R (Rho) which means Jesus (ΧΡΙΣΤΟΣ). And there is an M which stands for Mary. Whew. Finally the mystery of the logo solved! 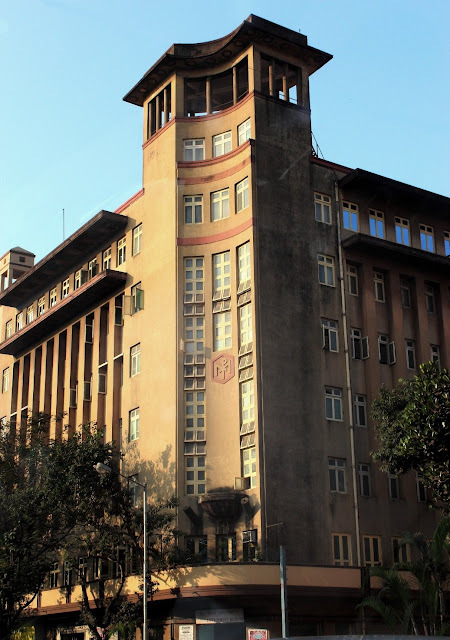 Seva Niketan also is home to an employment bureau and provides hostel accommodation for boys who study at the St. Xaviers College. The Jesuits run several programs from here; and if you're curious about what happens inside the building, here is one excellent example with photos. It is impossible to miss the Jesuit presence in Mumbai. They run parishes in Mazagaon, Byculla, Bandra, Andheri, Vasai and Thana. They have two centres in Bandra and Andheri where they offer retreats and counselling. 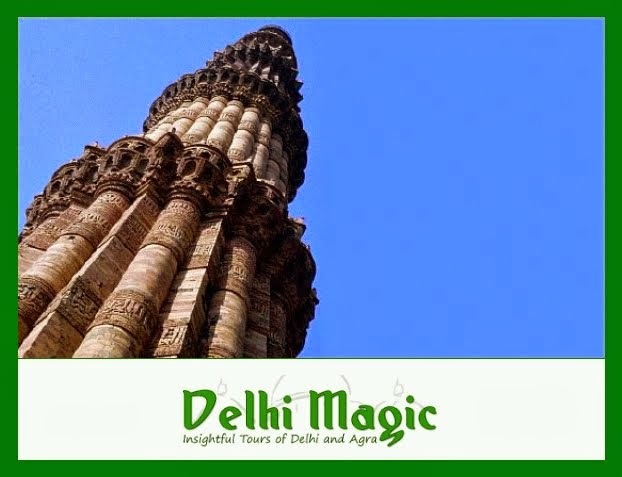 But they are best known for the many schools and colleges that they run in the city. These institutions are often quite different from each other, but have at their core, strong Jesuit values. 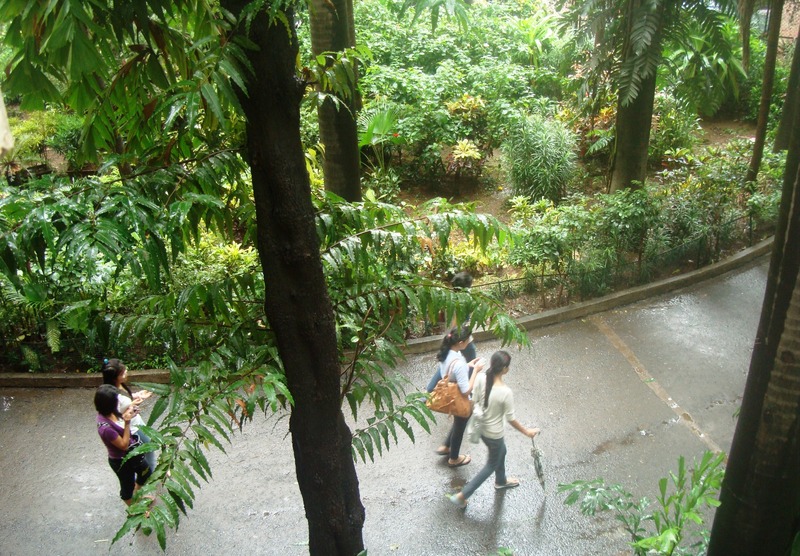 Each institute reflects the culture and socio-economic background of the neighborhood where it is located, as well as the influence of the Jesuit admission policies. My daughter goes to St. Xavier's College in VT, which is ranked among the city's premier colleges. Because of the high admission cut-offs, the college is home to some extremely bright and talented young people. The college has a "quota" system, with 50% of all seats reserved for Christians. 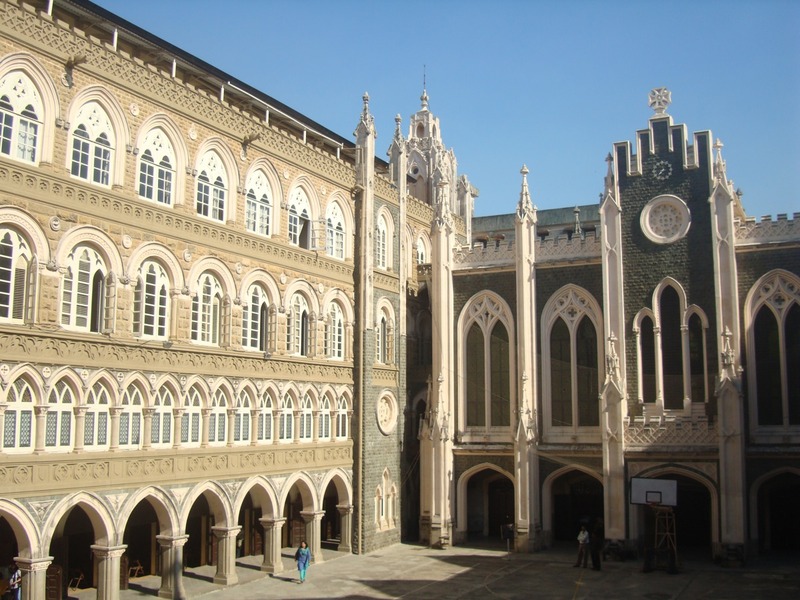 To fill these quota seats, the college usually has lower cut-offs for Christians. Apart from this, there are seats reserved as per government norms, for students with disabilities, students from backward communities etc. The "open" quota seats are very few, and the competition for those is fierce. 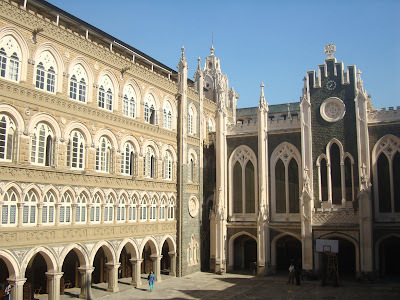 The students at St. Xaviers come from all walks of life; from the very rich to the very poor. There is a dress-code for college - no short skirts, no sleeveless /halternecks /spaghetti-strap tops, no capris even. Jeans and T-shirts are what most students wear on a daily basis. Parents are expected to know and be involved in the college lives of their children. There is an active social work program, and it is mandatory for all students to do a certain number of hours of community service each year. The Jesuit philosophy is clearly at work in this college, and seems to be working well. As a parent, I certainly have no complaints. I swear, this is the ugliest thing in the fish market that I have ever laid my eyes on :) :) Seriously. Look at that mouth: have you ever seen anything like it? 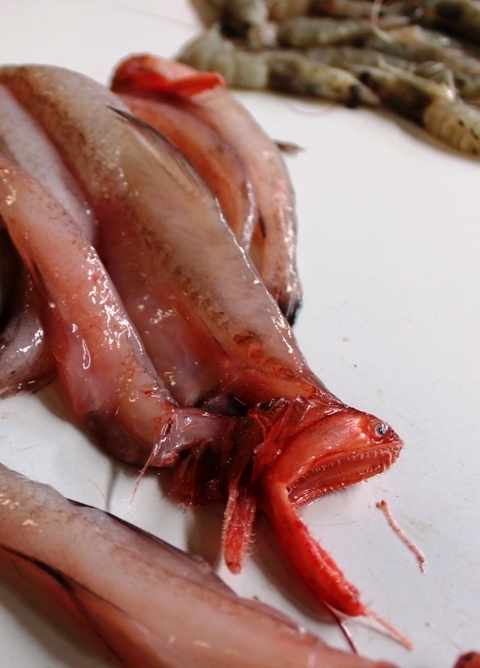 This then, is Bombay Duck, the lizardfish that is named after this city. It is found along the Western coastline of India, and also in the Indian Ocean. It goes by many local names - bombil in Marathi, bomla in Gujarati and lote mach or lotia in Bengali. The Parsis also make bombil-fry, except that they keep the fish whole, and while they do remove some water content, they don't dry it out as much as the Goans do. Their marinade is red chilli powder and turmeric, and traditionally it is deep-fried in rice flour batter. 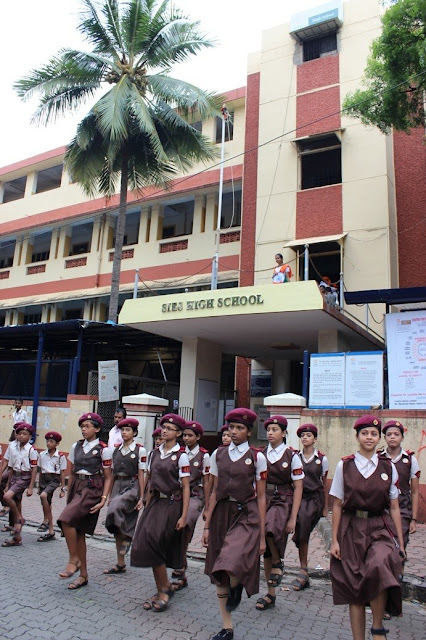 Many traditions change, but one of the things you can count on is the unchanging nature of independence day celebrations at school. 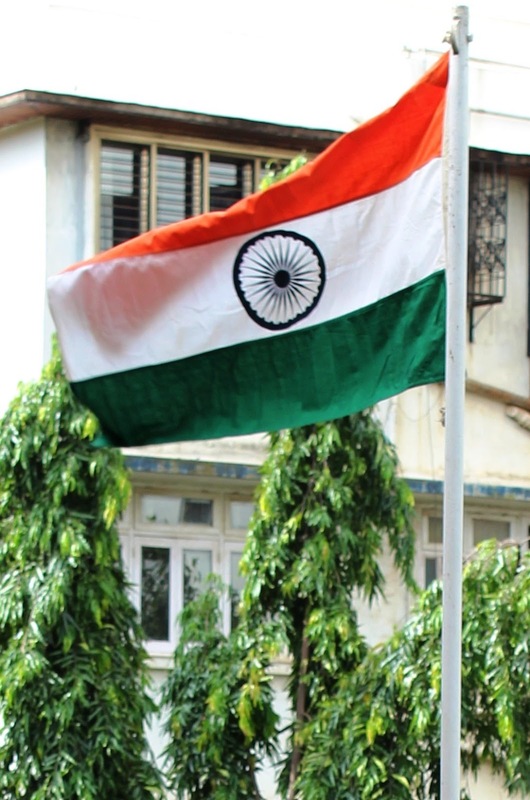 There's always a flag hoisting, of course. There are kids doing parades. There is a band. There are patriotic songs. There are speeches. 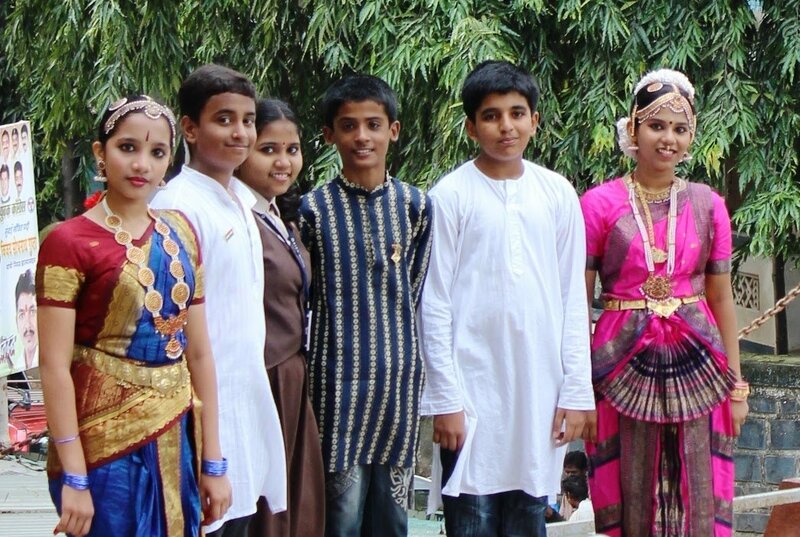 In my school there is a prize distribution ceremony and an entertainment programme as well. My aunt was the chief guest for this year's celebrations, so I went for the flag-hoisting ceremony. 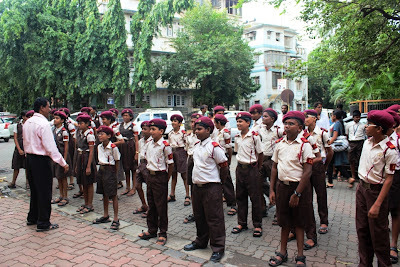 I got there early, and found the Road Safety Patrol kids lined up in front of the school. Here they are, boys and girls, their drill teacher is giving them the final instructions. There is some joking and kidding around. Because this is the monsoon season, they don't wear regulation socks and shoes. Instead they are allowed to wear black monsoon sandals. After some trial runs, things started to move smartly along with some marching. I was reminded of the time that I did this kind of left-right-left-right thing :) In my time the PT uniform was white skirt and white shirt. 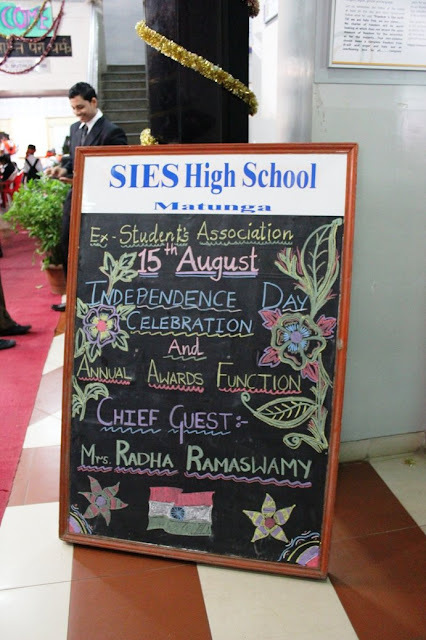 I walked into the school and spotted the board announcing the day's program. The coloured chalk hadn't changed :) even though the board now had a printed header. 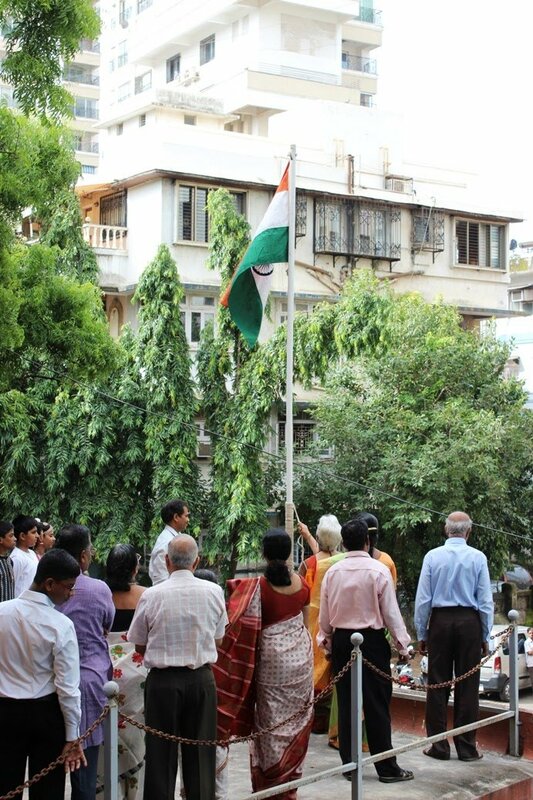 Here's the flag-hoisting ceremony; my aunt Radha is pulling the rope. After the flag-hoisting, we all trooped back inside, this time accompanied by the school band playing music and marching. 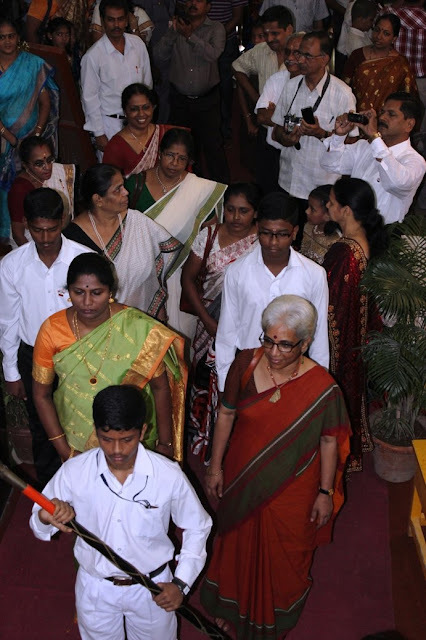 That's my aunt Radha, with the grey hair and glasses, behind the kid with the baton. She does some great work, using specific theatre techniques for social change. 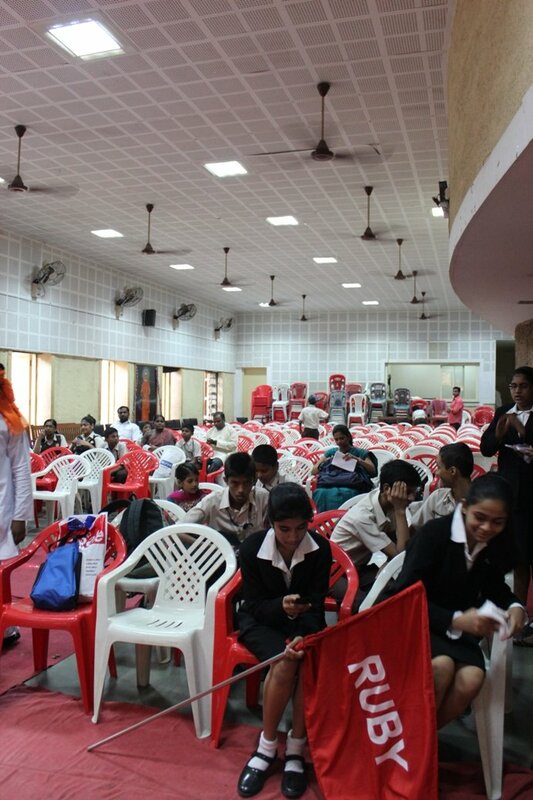 This is the school hall, where the annual day celebrations take place. Students and parents and teachers were finding places to sit, waiting for the ceremony to begin. There would be the usual welcome address, then the prize distribution, then speeches, and of course, the kids would put on an entertainment programme with dance and music and drama. 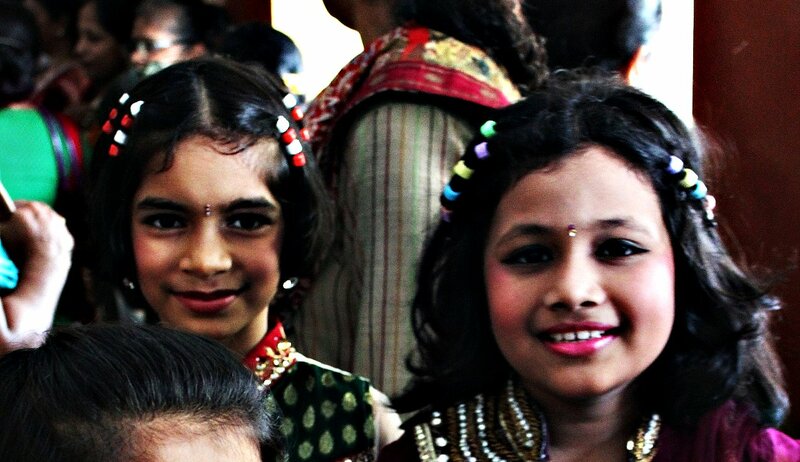 There were several children in make-up waiting backstage for their turn to perform. I've done that so many times! I was always in some dance or drama or the other!! 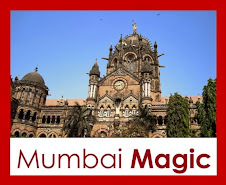 If you've been reading this blog for a while, you'll probably know this: I've frequently spent some sinful mornings in South Mumbai, wandering through Crawford Market (spices and foodstuff), or shopping at Mangaldas Market for fabrics. 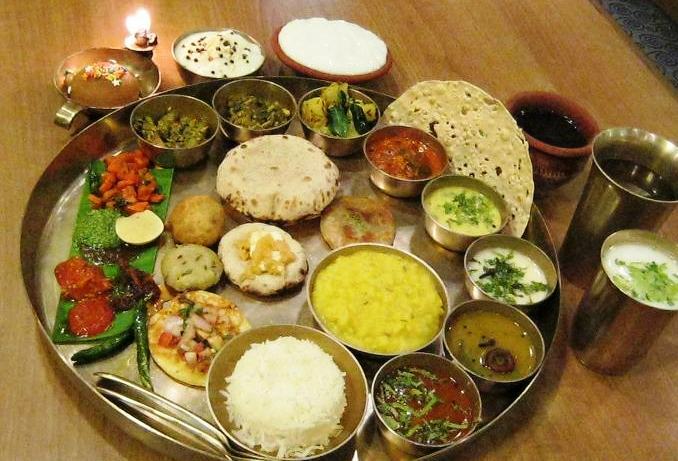 A day of shopping usually ends with a stupendously sinful Rajdhani thali for lunch. The Rajdhani restaurant in the photo above used to be tiny and narrow, looking more like a coach on a train than anything else. The service was old-fashioned, and the food was delicious. A couple of years ago, I walked past there hoping for another fabulous meal, and was hugely disappointed to see it had shut down. When I asked around, I found that Encore Hotels (which owned the Rajdhani brand and the restaurant) had sold the Rajdhani franchise to Mirah Group. As part of the sale, Mirah Group decided to just take the brand, but not the restaurants themselves. So not only did they close the original Crawford Market branch - the very first in the Rajdhani family - they also closed a larger Rajdhani outlet at Opera House (leaving behind some very saddened diamond traders! ), and also a smaller one at Metro Cinema. I've had many happy meals in these places - they are a little slice of Mumbai lore - so I was really sorry to see the restaurants go. Instead, Mirah Group have opened a large Rajdhani at the swanky Palladium Mall. I haven't eaten there yet...it just doesn't fit into this very Westernised mall. It seems to me that the location and character of a thali restaurant is just as important as its food. At Crawford Market, among the bustle of the trading community, this restaurant seemed to fit right in. After doing business with all the Gujju-bhais in the shops and in Zaveri Bazaar, you actually *want* to eat a Gujarati thali! Encore Hotels (which still owns the physical space near Crawford Market) has used the space to set up a new thali restaurant right where the old one used to be. They've branded it Revival (the Crawford Market original), and they're offering a pretty incredible looking thali, with their very interesting "smoked chaas" demonstrations. I haven't been there yet, but I am looking forward to my next shopping trip. These days my favourite thali meal is at Status in Nariman Point. You see, Status used to be an old hangout of mine, because my office was right opposite it in Maker Chambers. I've spent many happy evenings there. 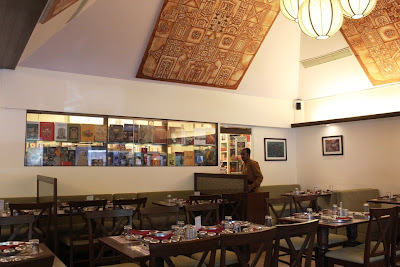 I loved Status then, and I still love it now - there is a great "Bambaiya" feel to it, with the Mangalorean managers and staff, the noisy office crowd, the Gujju and Jain clientele, the the super-quick service, and the excellent management of seating and waiting. I love their menu, because they offer three regional cuisines which are very popular in Bombay - South Indian, Punjabi and Gujarati. And they have several inventions of their own, also, they serve beer, perfect for a quick after-office snack and chat. The Gujarati thali is Rs 220 and it is totally fabulous. The chunda and the pickles are great, it's "all-you-can-eat", and the menu always has some interesting invention. I took my inlaws recently to Status and they loved it. I've taken many overseas visitors as well, and it's always a fun meal. The food is not crazily spicy (unlike the thali at Samrat, which I find quite inedibly spicy). Samrat at Churchgate is not on my list of favourites these days, after a recent meal that I found very spicy. I wonder if they had a new cook that day, because it didn't use to be that way. Have you been there recently? Should I give it another go? The other thali place I like is Chetana. 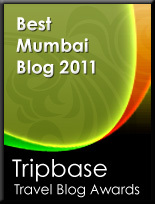 It is another slice of Mumbai lore, with its own history, ethos and feel. I love the full experience it offers, combining a book-shop with a traditional fabric and craft store as well as a thali restaurant. And what a great location, right inside the Kala Ghoda Art Precinct. 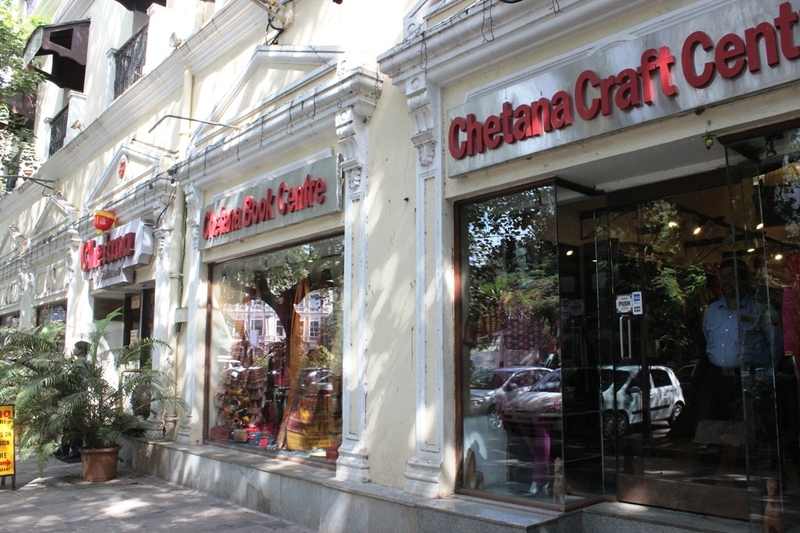 Chetana started out in 1946, just a year before independence. Originally it had an open floor plan, with space for cultural events, poetry-readings and discussions on philosophy. There was a bookstore, an art gallery area, a small cafe, and even one corner for chess players :) Lots of intellectuals hung out here, including Mulk Raj Anand and Nissim Ezekiel. The art gallery had chattai-clad walls, and on these were exhibited the works of Ara, Raza, Hussain, Padamsi and Souza. India's favourite cartoonist R.K. Laxman exhibited his cartoons for the first time at this gallery. When Jehangir Art Gallery opened, artists moved their displays there, so Chetana stopped exhibiting art works. Today, their bookstore is a great place to find a well-curated collection of Indian philosophy, travel, history, culture and crafts. And their restaurant not only looks great, it serves up a tasty set of thalis (Gujarati, Rajasthani, Maharashtrian). In the photo below, you can see the bookstore right behind the restaurant area. On the other side of the bookstore is the craft shop. 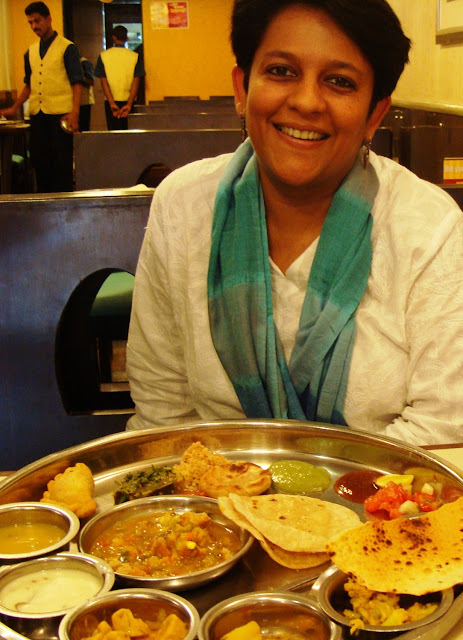 Chetana offers a "healthy" thali as well, but hey, what's the point? A thali is meant to leave you glassy-eyed, full and happy. The most fun thing about the thali is the starter, usually deep fried and calorie-rich. 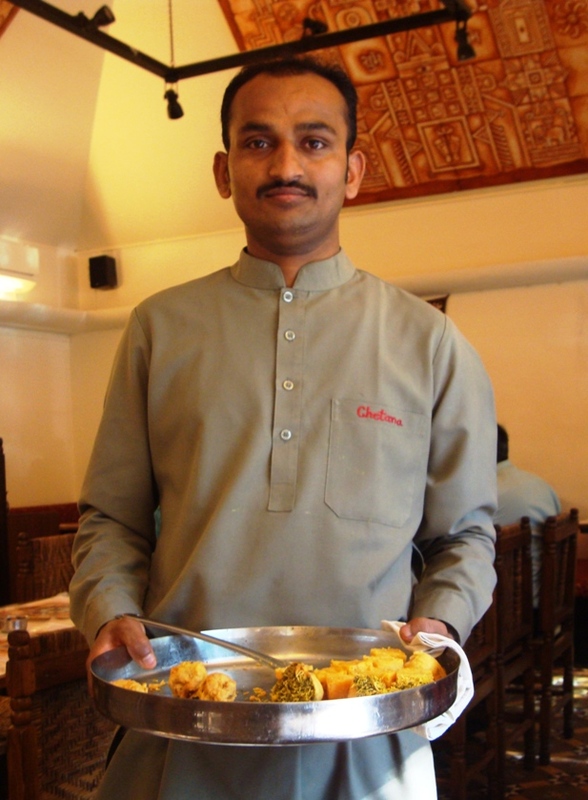 Here's our Chetana waiter, bringing us a second round of two delicious starters. It's mouth-wateringly good, I promise you. Go grab a thali meal today! !